What if the sinking of the Titanic in 1912 was yet another event in our history books – alongside virtually every event other of major significance – that was not an accident but was instead intentionally created and orchestrated by the elite? We know that the Rothschilds and other elite New Word Order families had their hand in funding, organizing and carrying out the American, French and Russian Revolutions; the political assassinations (attempted and real) of Andrew Jackson, Abraham Lincoln, MLK and JFK; and the false flag events of the sinking of the Lusitania in 1916, Pearl Harbor, and the fake Gulf of Tonkin Incident, all of which embroiled the US in wars the public would not otherwise have allowed. Was the sinking of the Titanic another Rothschild-Rockefeller-Morgan conspiracy? What follows below is a hypothesis or educated guess about what might have transpired. Read the evidence and decide for yourself. Isidor Straus – co-owner of Macy’s department store, Benjamin Guggenheim – an American businessman and successor of gold, silver and copper mines, John Jacob Astor IV – American businessman, real estate builder, investor, inventor, writer, lieutenant colonel in the Spanish-American War and a member of the prominent Astor family. He was the richest passenger aboard the Titanic, and was considered to be the richest person in the world at that time. These three strongmen were allegedly “thorn in the eye” for the U.S. banking cartels because of their opposition to the establishment of the Federal Reserve. Before we begin to describe how it happened, you need to know the background to the sinking of the Titanic. In those days of the early 20th century, many passengers on ocean liners were poor immigrants. The ships were frequently overloaded, and there were many overinsured ships, as insurance scams were common. Wealthy banker and industrialist JP Morgan was in charge of White Star Line, the company that built ocean liner ships such as the RMS Titanic and the RMS Olympic. Those familiar with conspiracy history may be aware of Morgan’s role in the life of Nikola Tesla, and how he bankrolled Tesla to develop new forms of energy, but pulled the funding after he discovered that Tesla was thinking about providing free energy to the whole world – unmetered. The Titanic and the Olympic was sister ships, almost identical in design. The Olympic was the first to set sail of the two, but right from the start was beset with problems. On her maiden voyage, she had a collision in the September of 1911, followed by another accident. She was repaired for 4 days in Belfast for a propeller that could have taken only hours to repair. The repairs involved taking a propeller from the Titanic for the Olympic. This fact is suspicious as you will later see. JP Morgan had a big problem. The Olympic was quite probably uninsurable, at least for the amount of money he wanted. The newspapers of the day – owned by Morgan and other rich financiers – talked up the Titanic and heaped praise upon her, saying she was of “unrivalled extent and magnificence.” They managed to attract the top movers and shakers of society, and entice them to take the trans-atlantic journey. 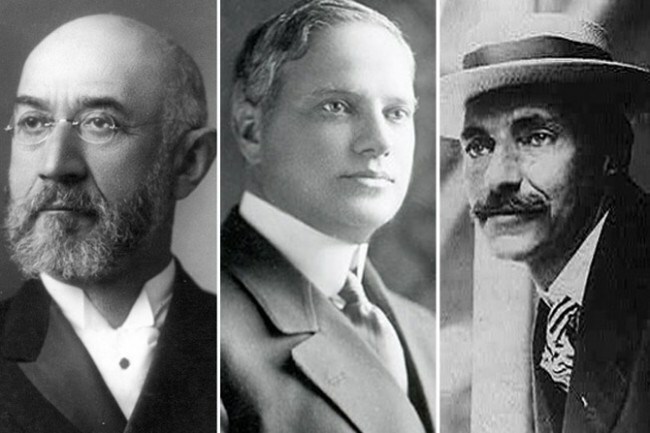 Among the passengers were 3 very wealthy and influential men at the time: Benjamin Guggenheim, John Jacob Astor and Isador Strauss. All were millionaires and all were opposed to the plan to create a private central bank in the USA, because it would negatively affect their personal fortunes. This of course was a big problem for the Rothschild-Rockefeller-Morgan cartel. The Rothschilds has risen to power and wealth, and had become the masters of Europe, by introducing private, central, government-sanctioned banks in England, France, Germany, Italy and Austria, and they weren’t about to let anybody stand in their way of capturing the grand prize and doing the same in America. It is quite likely at this point that JP Morgan hatched a wicked scheme that would kill 2 birds with 1 stone. He needed to get the Olympic insured and preferably off his hands to receive the insurance payout. He also needed to eliminate Guggenheim, Astor and Strauss so that there would be no opposition to his plan to be part of a new central bank in America. So what did he do? He switched the Olympic and Titanic ships! 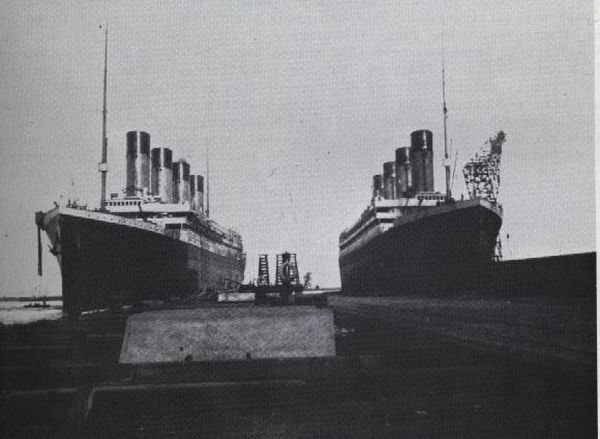 The Olympic and Titanic were nearly Identical ships. Since the Olympic was damaged beyond repair, they increased their insurance policy, and then switched it for the “Titanic’s” maiden voyage so they could murder the opposition to the Federal Reserve and collect the insurance money. In the video above, John Hamer presents impressive photographic evidence of the switch, including a picture of the “Titanic” sailing off on its “maiden voyage” with 16 portholes (the Olympic had 16 portholes and the Titanic 14 portholes). Hamer also presents other evidence such as from the 1986 Titanic wreckage discovery by Robert Ballard, who found a grey underboard (originally the Olympic’s was grey and the Titanic’s was black). He also found a propeller with the number “401” (originally from the real Titanic, but switched and given to the Olympic during the Belfast repairs). The Olympic’s maiden voyage was full, yet the Titanic’s was half full. Around 50 first class passengers cancelled their reservations on the Titanic at the last moment, all of whom were friends or colleagues of JP Morgan. He himself was due to ride but did not show up, claiming he was ill, yet was seen 2 days later at a French Resort in good health with his mistress. The chief officer in command (second only to the captain), a man by the name of Henry Wilde, wrote a letter to his sister in which he stated: “I still don’t like this ship.” Why still? Captain Smith was chosen to pilot the vessel, despite his atrocious track record of safety with previous ships he had commandeered. There was another massive ship patrolling the Atlantic when the Titanic was setting off. It was called the Californian, and its captain was a man named Ward. He appears to have been in on the conspiracy. Strangely (or not), the night before the Titanic hit the iceberg, Captain Ward slept fully clothed all night on the sofa, kept the ship’s boilers going (using precious fuel; standard practice was to turn them off at night), kept the crew on standby all night, and ordered his ship be dead stopped in the middle of the night, in a sea of ice. The Titanic received 6 messages on the night of April 14, 1912. Of these, 3 were warnings of icebergs, and 3 were from Captain Ward to Captain Smith. It was recorded that the Titanic’s stopping distance from full speed was 850 yards (around 1/2 mile), and we know from the testimony of the 2nd officer Charles Lightoller that the iceberg was visible from 2 miles. Therefore, it should have been relatively easy to avoid. Yet, incredibly, once the iceberg was sighted and the order was given to port around it, the engines of the Titanic were inexplicably reversed, so a collision could not be avoided. Were the engines tampered with in Belfast before departure? It is also strange to consider what happened with the distress signals. The Californian was only 19 miles away from the Titanic when it hit the iceberg, yet due to the curvature of the Earth in that part of the Atlantic, the ships couldn’t see each other. The Titanic sent out distress signal rockets, in red, blue and white, yet the Californian only saw white rocket signals, which it chose to ignore. At the exact same time of the sinking of the Titanic, there was illegal seal-fishing boat called Samson in the vicinity, which was sending up white rocket signals, thus confusing the matter. The Samson was directly in between the Californian and Titanic. What are the chances that another boat would be in that exact part of the ocean at that time sending off different-clored rocket signals? As with many other conspiracies, key witnesses seem to have magically disappeared. We are told that the 1st officer William Murdoch committed suicide, and that the 6th officer James Paul Moody drowned. The 2nd officer Lightoller was the highest in command to survive, yet at both the American and British inquiries after the event, he was very evasive. He was repeatedly caught lying; for instance, he said he was in the water at the time of the collision for an hour, yet life expectancy at that temperature (28 to 30°F or -2 to -1°C) is only 4 minutes! Lightoller actually wrote: “it was very necessary to keep one’s hand on the whitewash brush”, referring to the inquiries. At these inquiries, experienced sea captains said that icebergs of the size that collided with Titanic can be seen 3.5 miles away on a moonless night. It was normal procedure to maintain full speed during an iceberg sighting, so why did the Titanic stop? After the survivors made it back to land at Plymouth, the crew was immediately detained and held against their will overnight with no access to Union representatives. They were coerced or bribed to sign a document called the “Official Secret Act”. John Hamer concludes his above presentation by saying that the coverup could not have happened without collusion of the Government. It is now 2014, and we are more than 100 years past that fateful date of the sinking of the Titanic in 1912. The Federal Reserve Act of 1913 was passed without opposition, the Rothschild-Rockefeller-Morgan cartel has cemented their own personal central bank in the “Land of the Free”, and US debt now surpasses $18 trillion. We are, unfortunately, still some distance away from reaching a critical mass of people who understand how the current banking system enslaves us, and who have enough knowledge, desire and power to change this system. I hope that the truth around the sinking of the Titanic becomes widely known, and serves as a wake up call to those who value freedom. Thanks to John Hamer for doing the research on this important historical event, and uncovering some of the deeper truth behind the sinking of the Titanic.